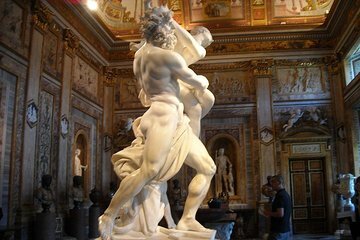 Bei dieser Tour in kleiner Gruppe durch die Galleria Borghese genießen Sie den Zugang zu einer der besten Kunstsammlungen Roms. Begeben Sie sich mit einem professionellen Führer auf eine Tour durch dieses wichtige Museum, das normalerweise vorzeitig ausgebucht ist und in der ehemaligen Villa Borghese untergebracht ist. Treffen Sie Ihren Guide vor dem Eingang der Galerie oder wählen Sie die Abholung in Ihrem Hotel in Rom. Die Gruppengröße ist auf maximal 15 Personen begrenzt, um sicherzustellen, dass Sie von Ihrem Guide personalisierte Aufmerksamkeit erhalten. Lovely tour,fabulous art and wonderful park like gardens. Only way to see the Borghese Gallery. Knowledgeable guide. If you visit on your own you must have a reservation. Only allowed 2 hours with or without a guide. Book the tour. You also get a walking tour thru the gardens. It was great for someone who doesn’t know all the history of the pieces and the venue. There is a walk through the Gardens afterward so be prepared to stroll! The guide was very knowledgable and kept us away from the crowds. This is a small museum and sells out quickly everyday so book early. Because of flight cancellation I was unable to attend this tour, but my friend thoroughly enjoyed it. This guided tour focuses on the best and most interesting art and sculpture in this private collection. Our guide was on-time, pleasant and knowledgable. He also helped me get between floors by asking staff to assist me using the lift as I had a recently injured foot and cane. I felt the pace of the tour was slower than necessary, even allowing that the guides try to coordinate their groups through the rooms for less-crowded viewing. This is an art appreciation tour. The artwork is beautiful and the walk through the gardens is delightful- even with a cane. This tour was well worth it - knowledgeable guide, described the major exhibits of the Gallery and grounds very well. I was also impressed by the tour company, Gray Line - I Love Rome by Carrani Tours. I booked the tour less than 10 hours prior, as my original tour was cancelled last minute. The tour was full, but I was able to book it through Viator due to a glitch in the website. They let me join - I had to pay in cash for my Gallery ticket because it was not pre-purchased with the rest of the group, but my credit card was almost immediately refunded the cost. The Borghese Gallery is a must if you visit Rome, and I would definitely see it with this small-group tour!! We saw this tour towards the end of our trip in Rome, and maybe I was jaded. It struck me as pretty much just another ostentatious building, stuffed with sculptures and paintings and other objects meant to impress. I would have loved a more thorough introduction to the family who lived there, comments on changes in society through their time there, the transition of the museum to state ownership, how or if the building had and has any significance to locals. As it was, I found it to be pretty much just another crowded tourist stop. Skip the line does not mean less crowded. Keep that in mind if you are thinking of this tour. The guide was excellent.